This is Part IV in a series describing L.A.’s water supply problems and the policies that produced it. 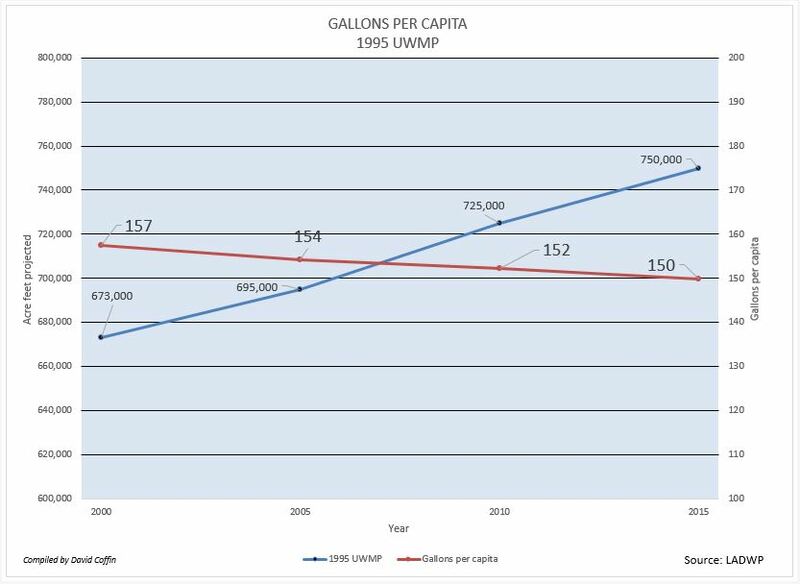 In Part III we saw how the city sought to maintain the 1985 baseline of ~175 gallons per capita daily in the 1990 UWMP while population estimates increased. 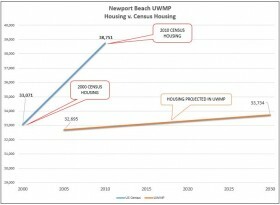 As a result we saw the projected supply in the plan jump significantly from the previous plan. We also found that the DWP heavily leveraged the projected 1990 supply in the groundwater and recycled categories using water it had no chance of getting. These factors continued into the 1995-2000 UWMP's. 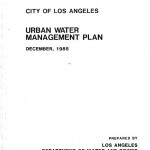 The 1995 UWMP should best be known by the city’s acquiescence that water supply had its limits. Population estimates from the Southern California Association of Governments (SCAG) did not climb as dramatically as they had in the 1990 plan but the increase from 3.85 million to 4.25 million by 2015 (9%) was still the driving factor. 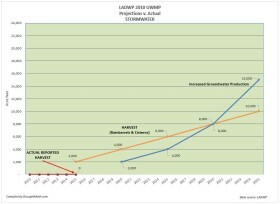 With future growth estimates continuing to drive the supply requirement of more water, DWP planners were forced to set a new precedent by reducing the per capita supply from 177 gallons per capita to 150 gallons acknowledging that less water would be coming through the Los Angeles Aqueduct due to recent court ordered restrictions of Mono Basin water and at current allocations, future growth would have demanded ridiculously large amounts of water that couldn’t be met. 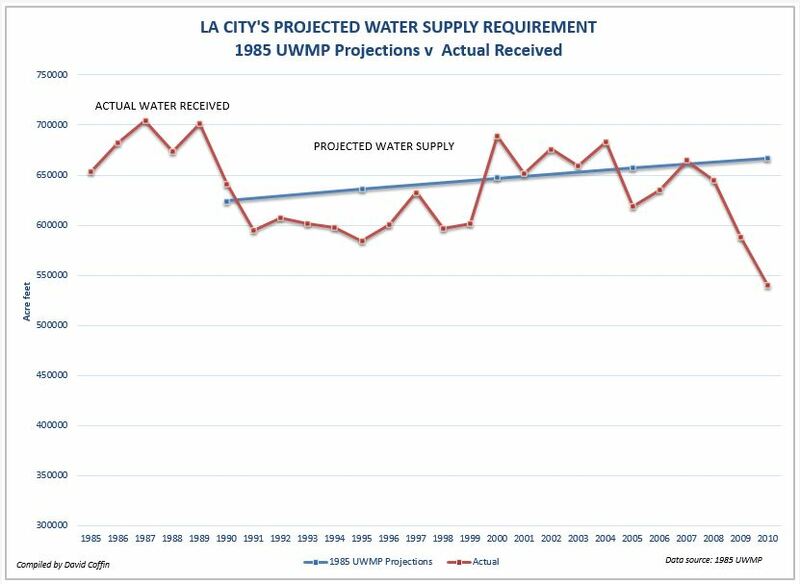 If the DWP planners tried to sustain the 177 gallons per day cited in the 1990 plan, the projected supply in the new plan would have shot up to 757,000 for 2000 and risen to 886,000 acre feet per year (Af/y) by 2015! Historically though, reducing the per capita supply to 150 gallons per day per capita would not be enough. At this allocation the DWP suggested that it would have 695,000 Af/y by 2005 and could gradually increase that to 750,000 Af/y by 2015 (Figure 1). But in the years following the approval of the plan, the actual supply figures that came in would demonstrate the DWP's failure to achieve these projections suggesting that there was far too much paper water in the projections to be viable. DWP planners accepted that less water was going to be available through the aqueduct system and reduced the aqueduct supply by 20,000 Af/y to 360,000 Af/y in the 1995 plan. 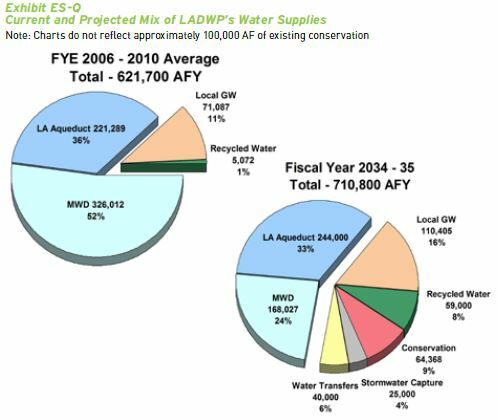 To offset the loss of aqueduct water, DWP planners suggested that they could increase the already large projections of the 1990 plans and increase the availability of recycled water to 38,000 Af/y, and groundwater to 152,000 Af/y. Through the years though, none of these figures would ever be achieved. 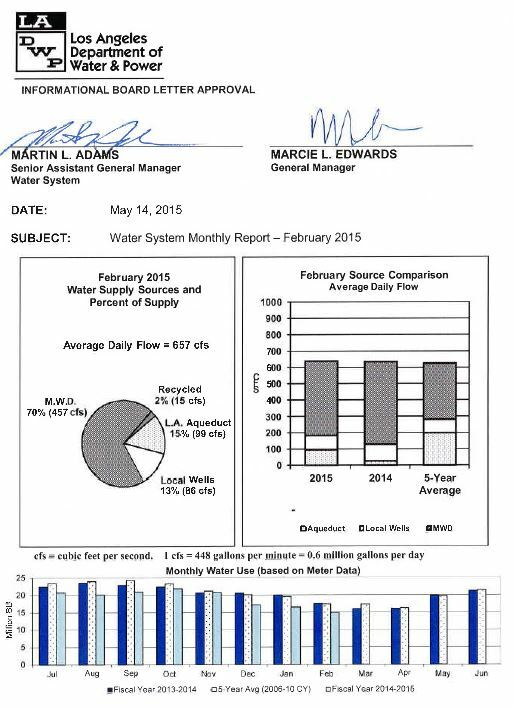 Recycled water averaged a mere 2,300 Af/y and groundwater averaged just 87,000 Af/y proving the plan wasn’t working. The historical significance of the 1995 plan was that the DWP would only muster up an average of 638,490 Af/y (Figure 2). Far less than the 750,000 Af/y that it promised. Because of the paper water fueled growing deficit, the DWP would start prodding the public into reducing its demand using such schemes as tiered pricing, washer rebate programs and require that all homes install low-flow toilets before resale. 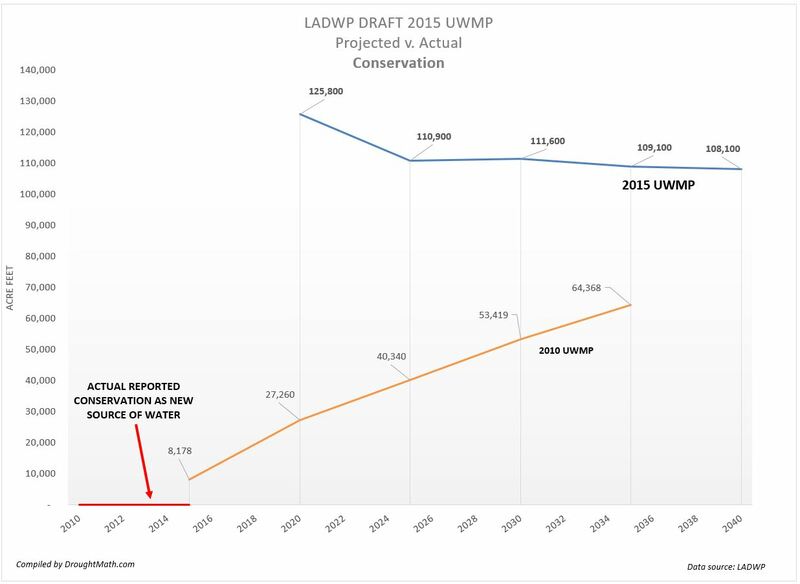 L.A.'s fourth water plan might best be known as having to largest projected supply that the DWP said it could meet of any of the city's UWMP's. This monster projection occurred even as the department further reduced the gallons per capita daily water supply. The reasons were due to estimated population projections supplied by SCAG. The new SCAG population estimates started out at 4,035,305 by 2005 population and would grow to 4,856,887 by 2020. These new population figures when figured into the new per capita allocations created a demand that would skyrocket to almost 800,000 Af/y. But the lower allocations would still generate a sharp rise in demand. The DWP said it could supply 718,000 Af/y of water in 2010 and sharply increase in to 799,000 Af/y by 2020. The increase though didn't come from increased recycle and groundwater. Perhaps realizing that developing a recycled water system and pumping more groundwater was not paying the dividends they predicted earlier, the city ended its long standing resistance to relying on pricier MWD water and would ratchet up purchases of water from 200,000 to 298,650 Af/y which would nearly equal the aqueduct supply level. Planners were forced to lower the recycled water projections 28% from 38,000 to 29,350 Af/y. Groundwater projections fell only slightly from 152,000 to 150,000 Af/y but aqueduct projections fell significantly from 360,000 Af/y to 321,000 Af/y. L.A.’s recent drought has been going on far longer than the statewide drought. California’s last drought was declared in 2008 and ended in 2011 and another declared in 2015. L.A’s drought was declared in 2008 and was never rescinded. So why has L.A.’s drought been so persistent and growing by the day? 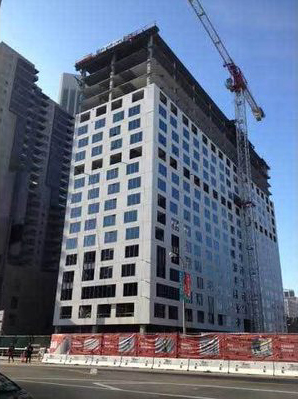 This brings on another question we should ask is how does the city reconcile the endless approvals of new construction during a persistent drought? 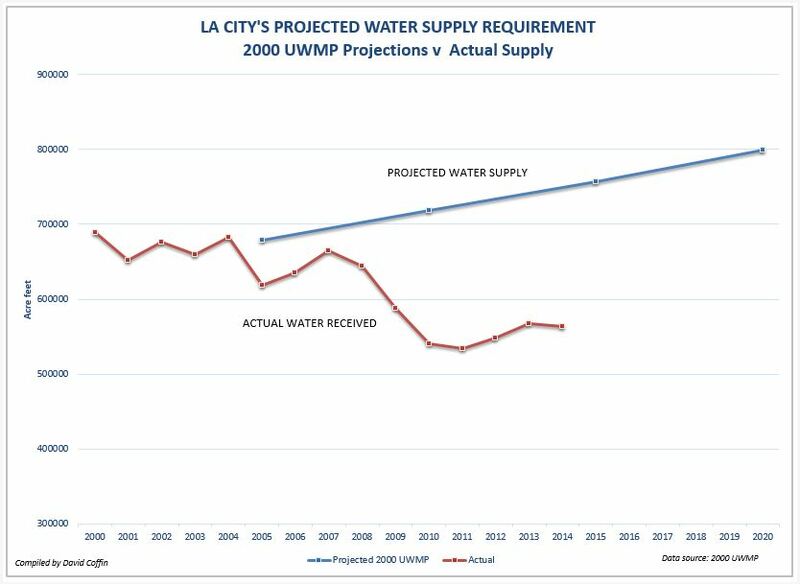 The short answer to both is that in order to provide evidence of sufficient water supply for projected growth, the city’s UWMP (Urban Water Management Plan) has been reporting that is has far more water available to it than it can get. Every UWMP from 1990 till now has projected supplies that exceeded 700,000 AF but when we look back at DWP records from 1990 to 2004 we find that the city’s total supply averaged just 627,000 Af/y. Since 2005 the average has fallen even further to just 590,000 Af/y. Simply put, the DWP has never met their projections and that has steered us head-on into a drought. 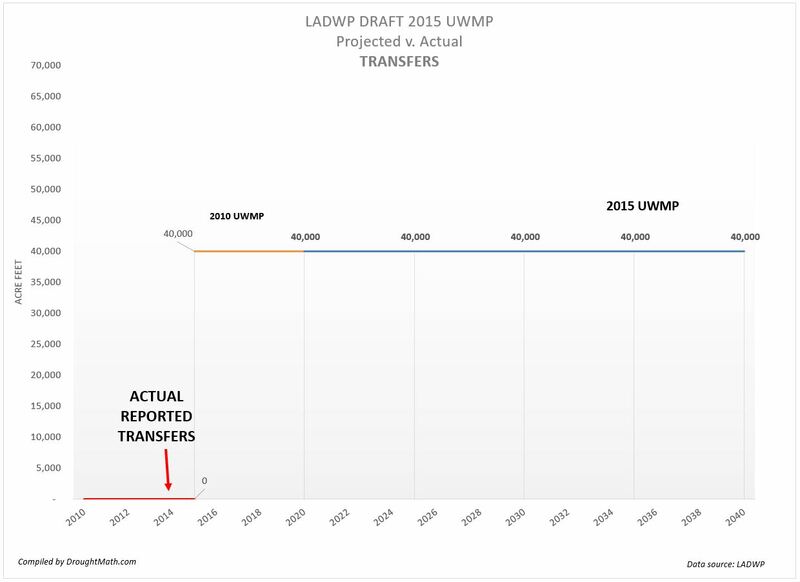 When DWP officials are asked why they haven’t met the projections cited in the UWMP, using a little spin they tell you that conservation efforts reduced demand and they didn't need to import as much as projected. This routine answer however is disingenuous since the projections include future growth and clearly the DWP hasn’t met that expectation given today’s restrictions on water. 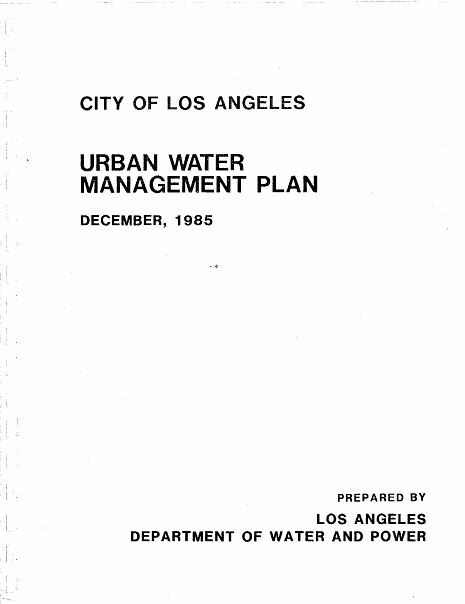 The 1985 UWMP set the city’s baseline water at 175 to 176 gcpd (gallons per capita daily). 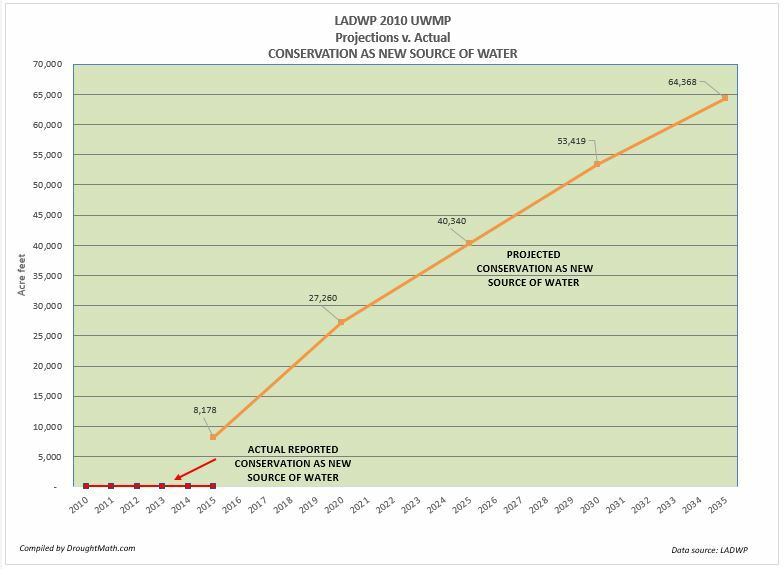 This number reflected the current level of water to residents, businesses, and industry, it included various conservation programs such as low-flow hardware devices and left room for projected population growth to 3.41 million by 2010. At this level the city cited that it would be able to meet the demand with a very reachable water supply of 667,300 Af/y. In 1990 however, the city’s population increased faster than the population projections that were cited in the earlier plan. Population projections in the new plan were now 14% higher and in order to maintain a similar per capita supply level and still meet projected growth, the plan’s total demand and supply projections jumped 13 percent to a not so believable 756,500 Af/y by 2010. In each of the subsequent plans from 1995 to 2010 would continue to cite available supplies over 700,000 Af/y and as high as 799,000 Af/y. So now the city was confronted with two conflicting demands. The first would be to provide enough water from a now shrinking supply that once averaged 680,000 Af/y and has now fallen to just over 610,000 Af/y and still meet the city’s need. The second was to show that its supply was growing and that it would be sufficient for continued growth. 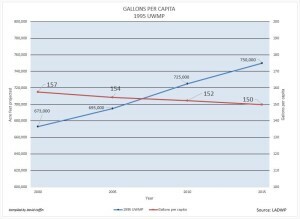 In an attempt to solve the first problem, the city’s 1995 water plan would have to ratchet down the per capita rate to 150 gallons per day to lower the total demand otherwise we would seen demand in excess of 875,000 Af/y. 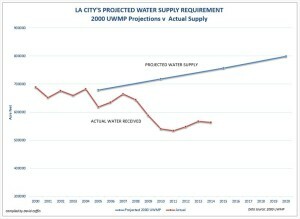 However even 150 gallons per day wouldn’t be enough over the short term and the city would also have to implement more draconian methods to lower the per capita further by imposing an Emergency Water Conservation order on single family residents and reducing residential billing unit allocations. 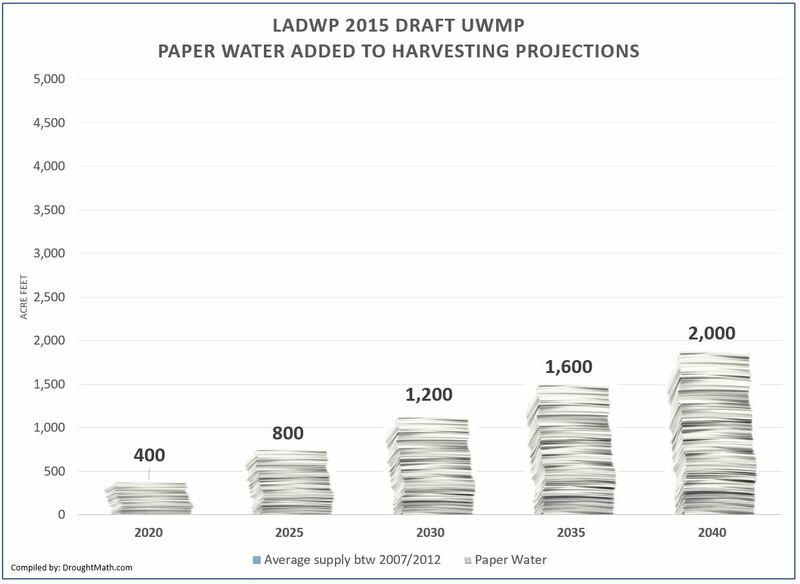 The second problem to show a growing water supply over the long term to meet the city’s growth ambitions would require a little sleight-of-hand by the DWP using ‘paper water’. Paper water by definition is “water that an agency says it has available to it, but its water that is difficult or impossible to access.” and paper water can be measured by the gap between what an agency says it has available to it, and what it eventually gets. The wider the gap, the deeper our problems. California’s water laws require that planning agencies, and developers show evidence of current and future water availability for their project. 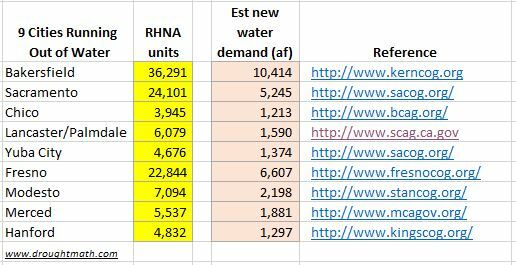 EIR’s and water supply assessments all rely on the projections cited in the UWMP so there is a great deal of pressure on the DWP to show that the water supply is growing, where the supplies are coming from and how much. If the water plans did not show evidence of future water availability that was sufficient to match population projections this could greatly hamper the approval of their projects and possibly stop them cold. In fact some cities in California today have stopped issuing water meters to new subdivisions for residential because they have no surplus of water. So where do we find the DWP’s paper water? With a little digging into the city’s past and current water plans we can find it in literally every category of the city’s water portfolio in literally every water plan. 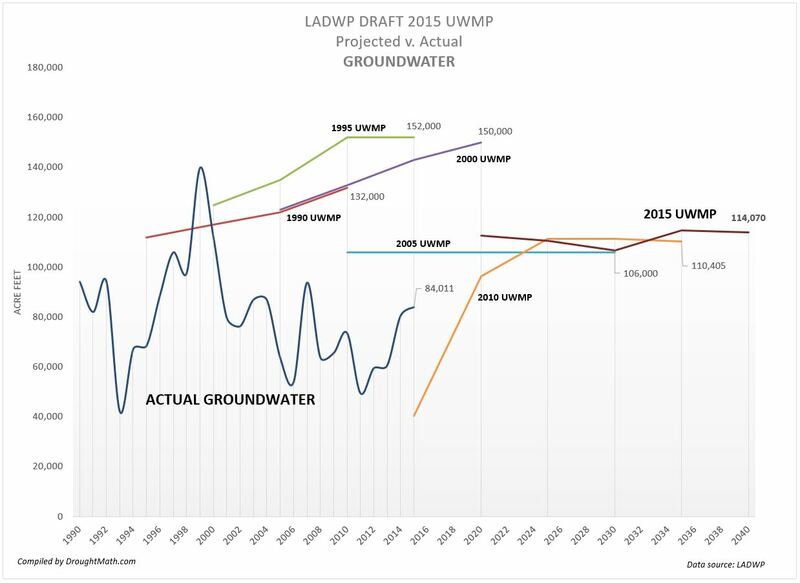 Our first stop to find paper water is in the DWP’s groundwater projections that are cited in each of the UWMP’s approved by the city between 1990 and 2010. The accompanying groundwater chart shows us a 79,500 Af/y gap between what the DWP says it would have to meet the city’s growth and the actual amount of groundwater the DWP had access to. 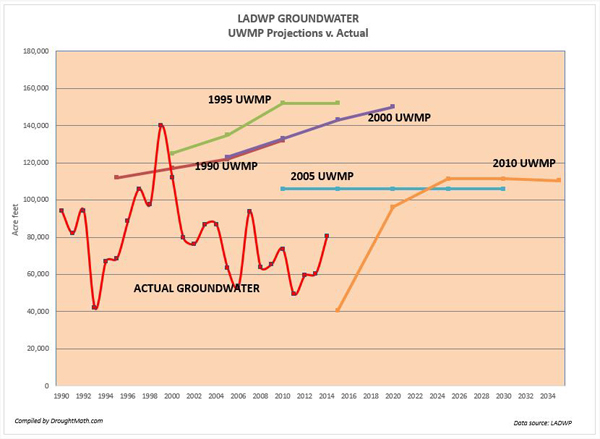 For example if we look at the groundwater projections in the 2000 UWMP, groundwater was projected to contribute 133,000 Af/y by 2010. However the average amount received between 2005 and 2014 was just 66,431 Af/y creating a 56% deficit of what they projected. This 56% is what we call paper water because these same conditions arise in each of the other water plans approved by the city. 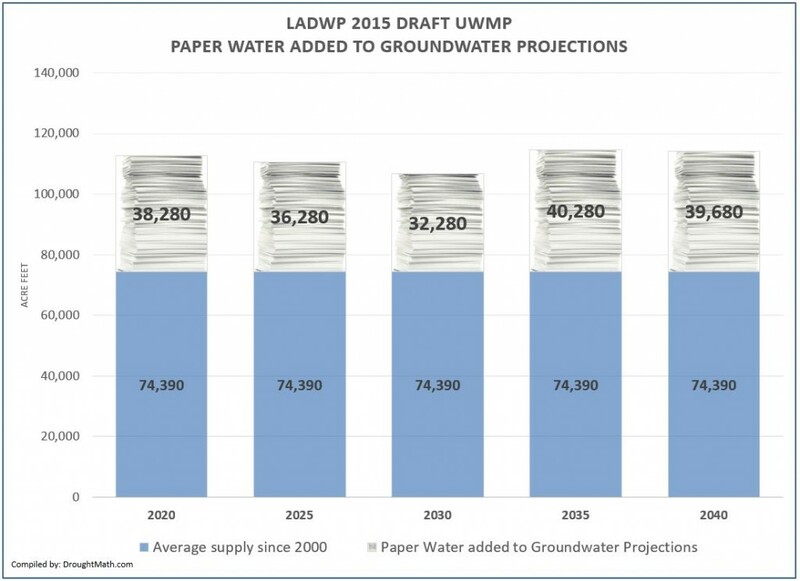 36% of the groundwater projection cited in the 1990 UWMP was paper water. 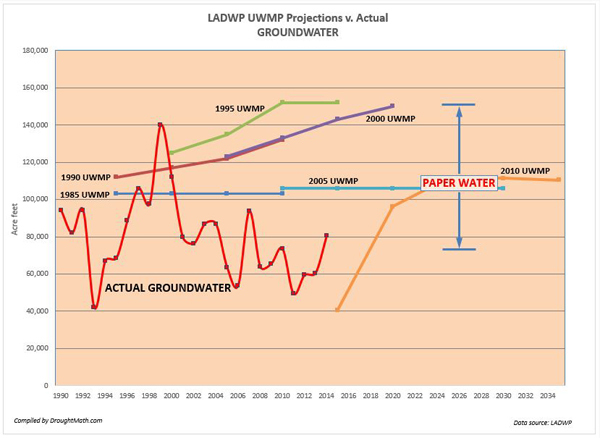 51% of the 1995 UWMP’s groundwater was paper water, and in the 2005 UWMP it is 39% paper water. 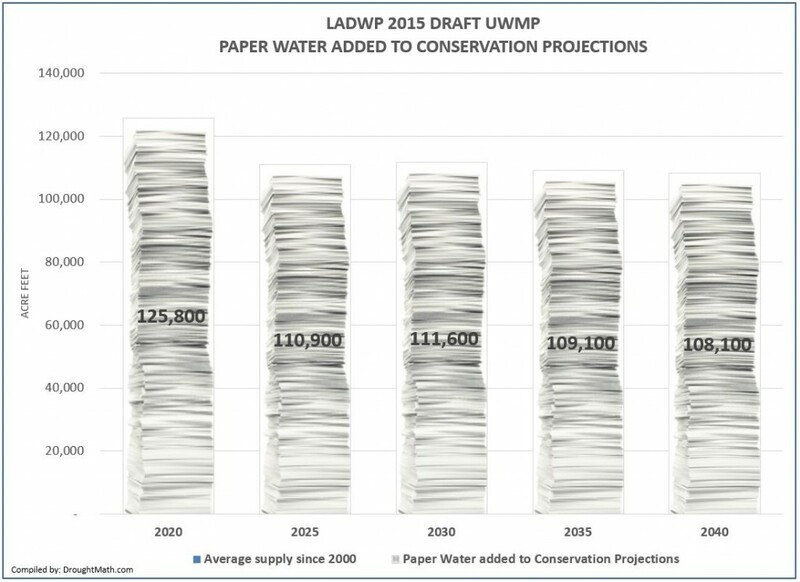 Over 24 years this paper water would represent about 1,088,000 AF of water that the DWP said it would have to meet projected growth but over time it would never receive. The city never stood much chance to meet these projections. Growth, fueled by paper water is at the center of blame. 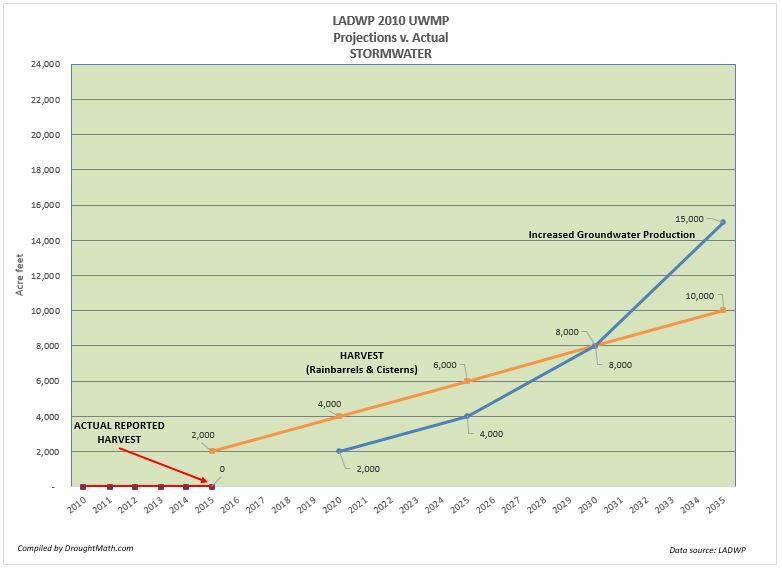 LAStormwater.org states that the city captures just 27,000 Af/y of storm water a year to recharge the underground storage. This low rate is attributed by ULARAwatermaster.com to the city’s built-out growth which has impeded the capture of groundwater because so much permeable soil is paved and built over. 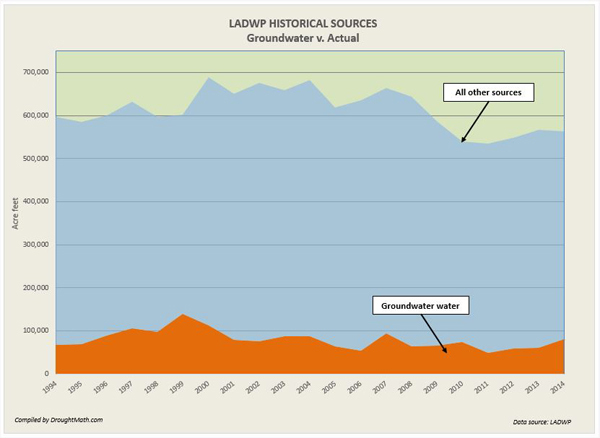 The Upper Los Angeles River Area Watermaster reports that most of today’s groundwater recharge comes primarily from LA Aqueduct and Metropolitan Water District imports. Further restricting groundwater pumping is that many wells were found to be contaminated in the mid 2000’s and had to be taken out of service. 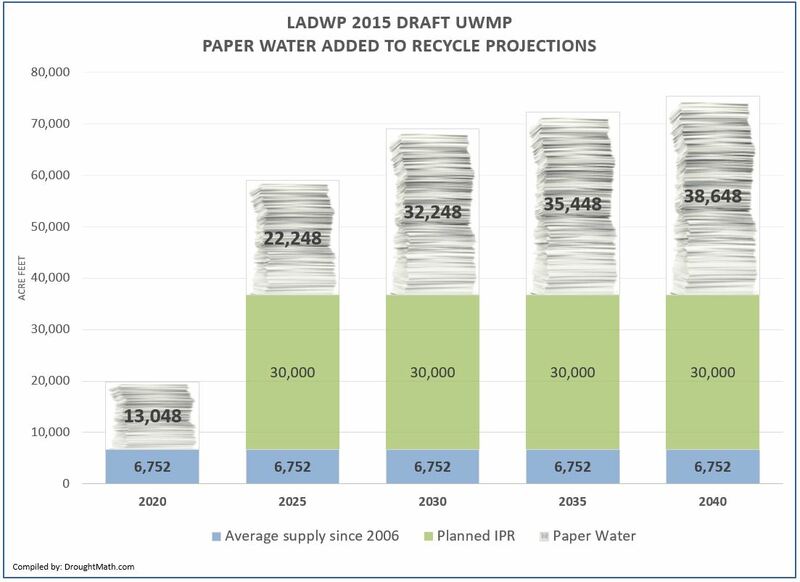 Our next stop where we find paper water in is the DWP’s Recycled Water projections. Urban Water Management Plans between 1990 and 2005 all projected rapidly growing recycled water supplies that later would never be realized. The Recycled Water chart shows a huge gap indicating that up to 91% of water supply the city claimed it would have access to for future growth is just paper water. 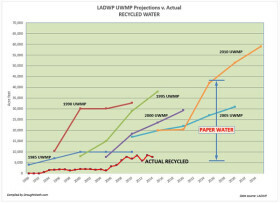 In one example the DWP projected in the 1990 UWMP that the city would have 32,800 Af/y of recycled water by the year 2010. This number like all projections would be used as evidence of future growth by planners. But this water would never be realized. The actual average reported yield between 1995 and 2010 was just 2,921 Af/y which was 29,879 Af/y below what was promised. This 91% deficit is our paper water. 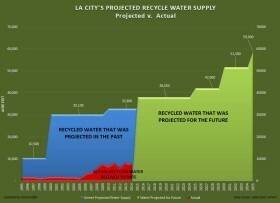 We find the same results in each of the other recycled water projections of plans that would follow. 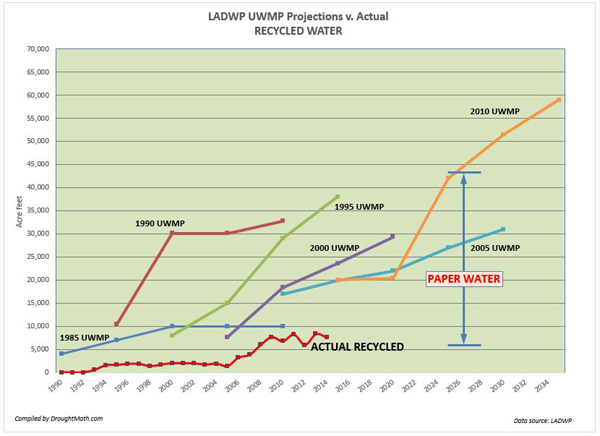 If we look at the 2010 projection in the 1995 UWMP, 84% of the 29,000 Af/y that was supposedly available ended up as paper water. In the 2000 plan, 75% of the 18,400 Af/y projected for the year 2010 ended up as paper. 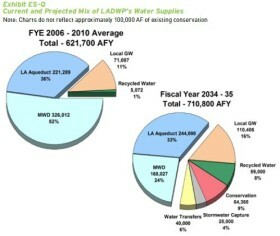 In the 2005 plan 65% of the 16,950 Af/y projected was paper water. Over 24 years this would represent at least 384,096 AF of paper water that the city said it had access to as evidence that it had sufficient supply for projected growth but it never received that water. Oddly, the DWP’s latest 2010 plan appears to be doubling down on paper water by citing that it will have 59,000 Af/y available to it by 2035. Already it looks like the first milestone in 2010 of 20,000 Af/y will be missed by a large margin which further demonstrates how that L.A’s drought and growth are built on paper water. 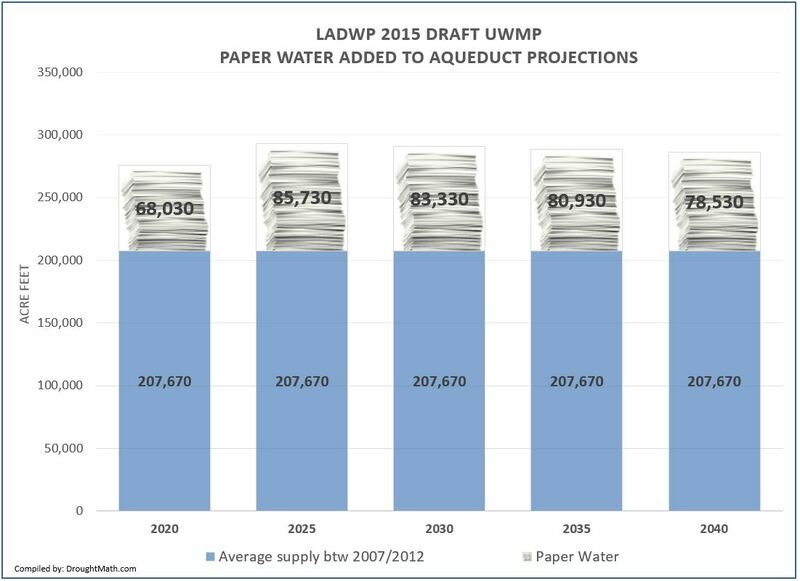 The city owned aqueducts have been our primary source of water since 1913 but in recent years it has also become the UWMP’s largest contributor of paper water. 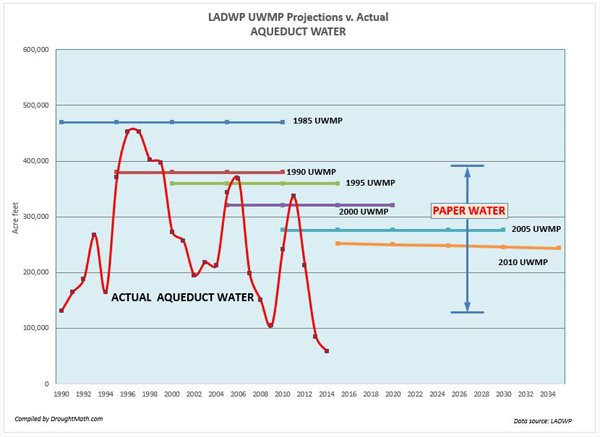 Even though the aqueduct’s projections in each plan would fall incrementally due primarily to environmental mitigation, the percentage of paper water would increase from 38% during the 1990 UWMP reporting period to 54% by the 2005 UWMP reporting period. 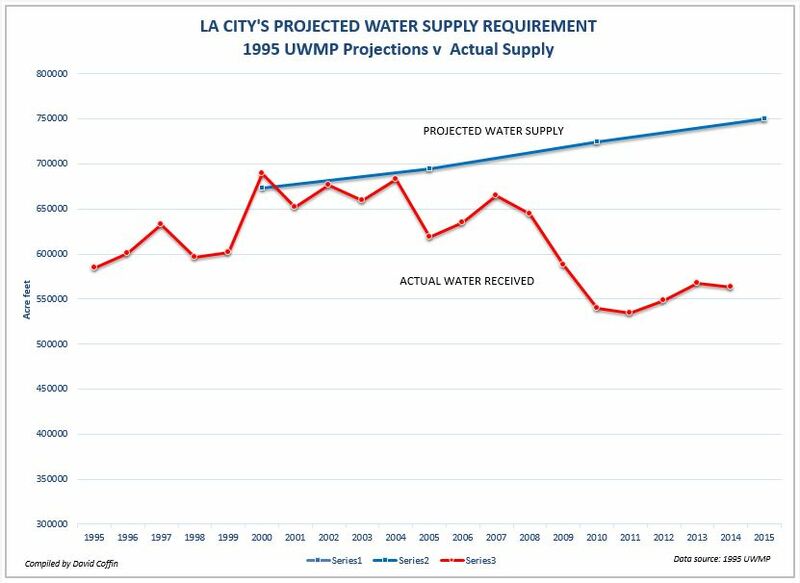 In this example, if we look at the 1995 UWMP, aqueduct water was projected to be 360,000 Af/y which included surpluses for future growth. But that water never came down the pipe. The actual total reported supply was just 217,258 AF/y between 2000 and 2014 was 142,274 Af/y below what was promised. This meant that 43% of the projected total was paper water. 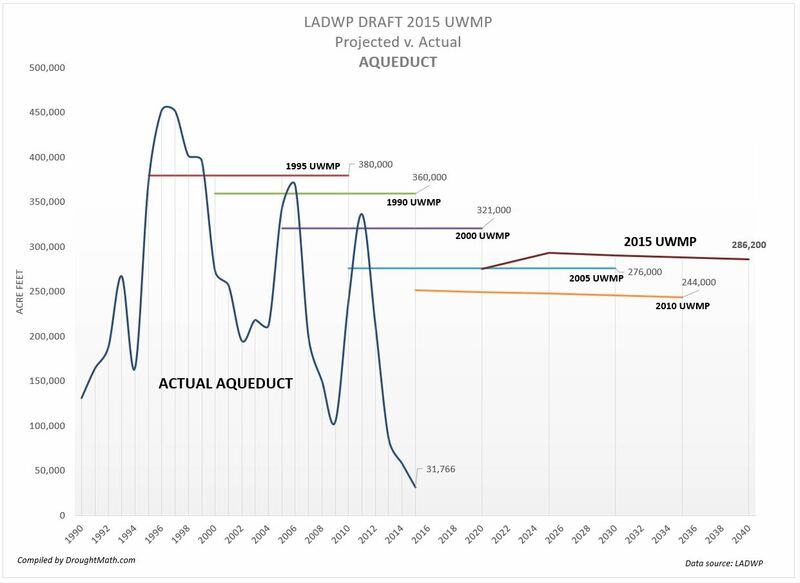 The 2000 UWMP projected aqueduct supplies to be 321,000 Af/y through to the year 2020. 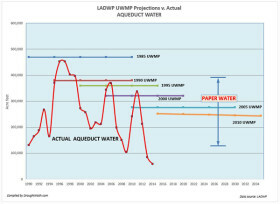 However to date the average supply has been just 210,132 Af/y meaning that 45% of the projected supply was paper water. The 2005 UWMP would look worse. It projected 276,000 Af/y through the year 2030 but the supply beginning with its reporting period has been just 173,393 Af/y meaning that over half of the water projected in this plan, 54% was paper water. Over 24 years this would represent at least 1,863,000 AF of paper water that the city said it had access to as evidence of a growing supply but it never received to this date. 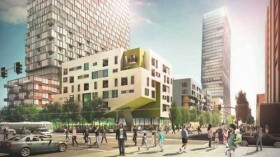 Projects in L.A. promise that MWD will meet any city shortfalls in the future. 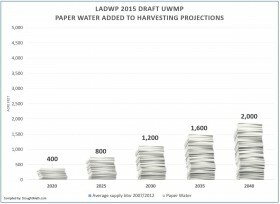 It’s hard to describe MWD water as paper water since most of the DWP’s projections for MWD water were greatly under reported from what was actually received. 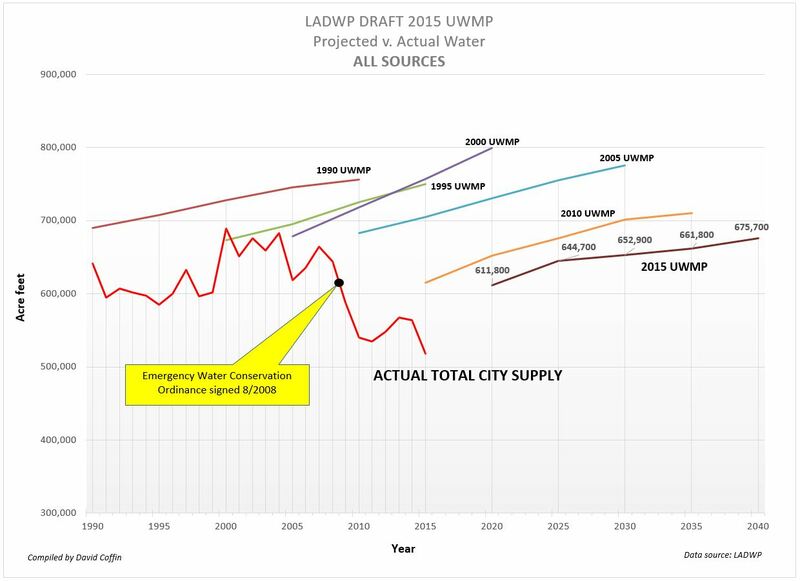 Typically when the City of L.A. fell short of water which was most of the time, the MWD would step in to fill in as much missing supply as it could. But water is a zero-sum resource and if you take more than your share of water, you’re taking it from another agency. There are limits to what the MWD could supply and history suggests that 423,000 Af/y was L.A’s limit. MWD water can be described as paper water because each of the city’s UWMP assures that any shortfall of city owned water would be made up by MWD water which is a promise that can’t be met. That is promise made to planners more than it is to the city’s residents. This category is a new form of paper water that was just introduced in the 2010 UWMP. 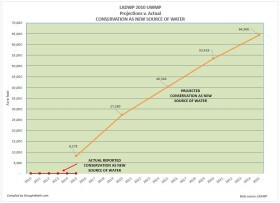 In past years, the term conservation applied to water supply that was already received by the city and the value attributed to it was measured by the reduced number of gallons per capita. 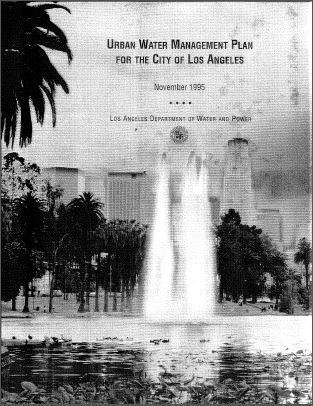 As mentioned at the beginning of this article, the DWP originally allocated about 175 gallons per capita in the 1985 and 1990 water plans which includes residential, commercial, government and industrial uses. The city’s conservation programs since then have reduced this to 141 gallons per capita using primarily Tier pricing and low-flow hardware devises. More recently it included so-called “turf buy back” and enforcement measures. In its simplest terms, ‘conservation’ is the ability to stretch out a given supply. The DWP in 2010 decided to turn this idea on top of its head and count conservation as a source of supply that adds to the city’s total supply. This appears to be another attempt to produce more water on the ‘books’, but water that in time will not be accessible. 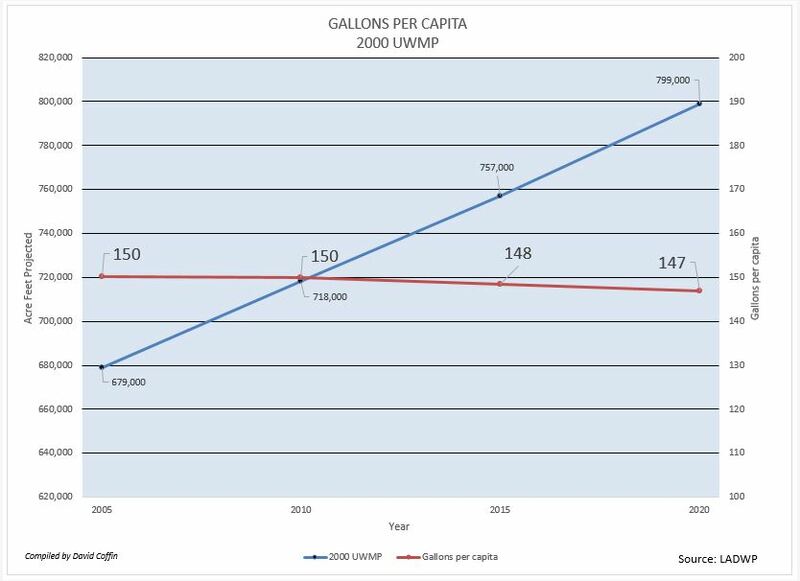 The 2010 UWMP appears to be suggesting that the city will receive 14,180 Af/y of new water by 2015 and up to 64,368 Af/y by 2035. This is another new category to the UWMP. Transfers may also turn out to be another form of paper water since water transfers from other agencies is solely dependent on them having surplus water which is in doubt these days. Most of the agencies the city could bargain with also depend on the SWP to supply them water. The SWP has been seriously cutting back allocations to their customers which includes the MWD. The 2010 UWMP projects that it will receive 40,000 Af/y through the Neenach pumping station. 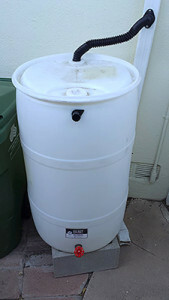 Only time will tell if this is a viable and reliable source of water. Overall the amount of water the city promised for future growth and did not meet is staggering. Each UWMP would follow a familar pattern. The first of the five year milestones would be adjusted relatively close to the current supply level and in the following 10, 15, and later milestone years, paper water would contribute to ‘unlikely to be reached’ levels of supply. 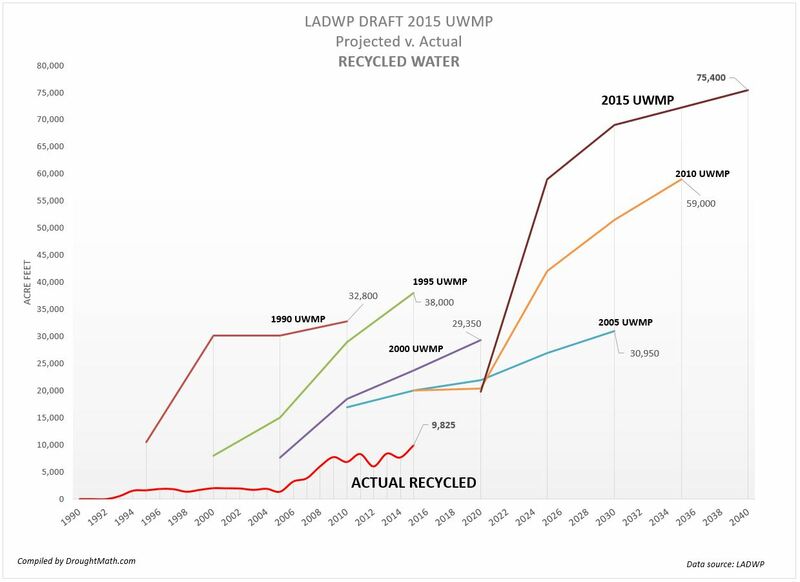 When we look at the 1990 UWMP for example we find that the total annual water supply projected by the year 2010 was 756,500 Af/y but the actual supply that came in during the scope of this plan was just 624,283 Af/y. Paper water represented 17% of total projection given the shortfall of 132,217 AF per year. The 2000 UWMP would raise the projections astronomically to 799,000 Af/y but as actual supplies came in, the average so far to date is just 617,645 Af/y thus producing a deficit of 181,355 Af/y per year. Over 24 years, this would represent 4,352,000 AF of paper water that the city said it had access to as evidence of a growing supply but it never received to this date. 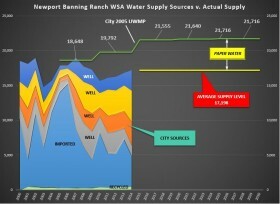 From the standpoint of development and the planning department, paper water is a good thing because the EIR’s, WSA’s and smaller projects that fall below SB-221 reporting requirements can all be assured that whatever their demand is, it will “fall within the available and projected water supplies” over the 20 to 25 year scope of the plan they are citing. Whether the city falls into a permanent drought is irrelevant to the approval process but it has huge repercussions elsewhere since the unmet demands means that the water must be found elsewhere when conservation isn't enough. These demands might be met by fallowing farmlands in the South San Joaquin valley or eliminating their supplies altogether forcing them to drive wells deeper to meet their shortfalls. From the standpoint of residents however, paper water means higher utility bills, lower tier allocations, and lower property values for the unlucky homeowners who have high density built behind their yards but worst of all, it means the city's water supply is no longer reliable. This article originally appear on City Watch LA. Part IV in a series describing L.A.’s water supply problems, the drought and the policies that produced it. 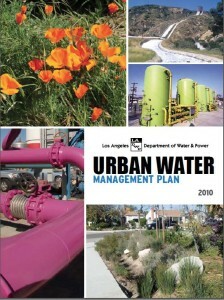 L.A.'s PAPER WATER Urban Water Management Plans of 1990, 1995, 2000, & 2005 had all projected huge demand requirements and provided us with solutions on how it would met. 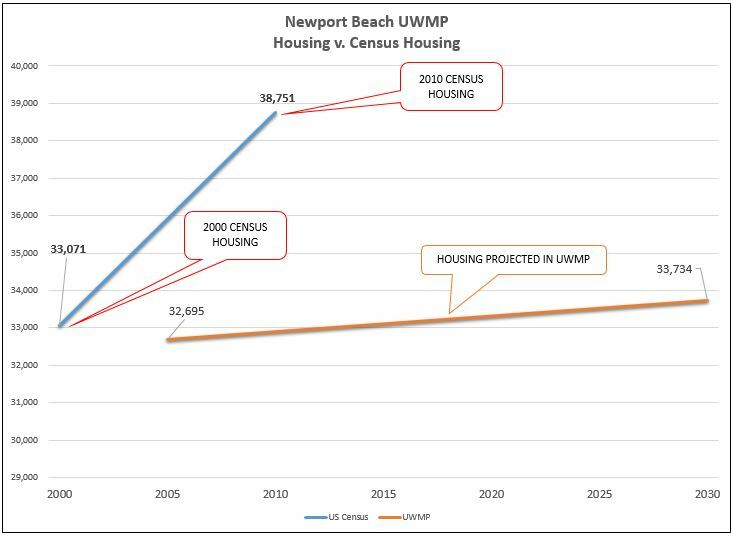 However, as each superseding UWMP was approved, it left behind a growing legacy of plans with a history of projections that were never met. Over time, it became apparent that this is not simply a miscalculation but likely an intentional effort by the city to mislead the public using ‘paper water’. Paper water is water that utilities claim they have access to, but is difficult or impossible to access for various reasons. You can't drink paper water or cook with it but you can make lots of promises with it. The 2009 California Water Plan Update describes such a scenario in an article titled Water for Growth (E. Hanak/PPIC) stating that "A majority of utilities reported considerable normal-year surpluses, both now and 20 years hence, raising the possibility that many are banking on “paper water” for their margin of comfort." 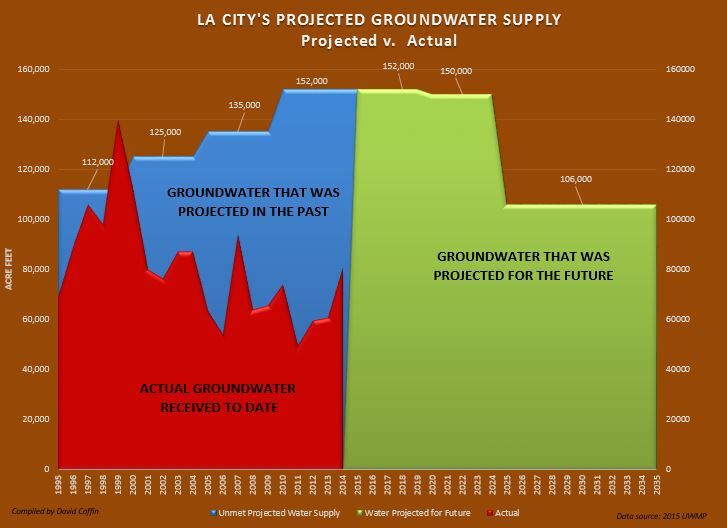 Generally the City of Los Angeles hides its supply shortage behind promises of water that it could never actually deliver on such as groundwater, recycled water and LA Aqueduct water. Large Projects One very typical example where paper water was cited would be the massive Playa Vista development that was approved in the early 2000's. 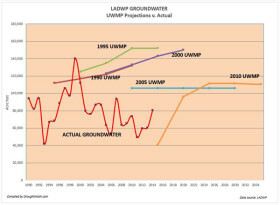 The project's water demand which was based on the 2000 UWMP stated: "LADWP anticipates annual water demand within the Department’s service area to increase by 2010 to between 718,000 AF (in a normal year) and 761,000 AF (in a dry year), which represents a demand increase of 5.7 percent to 12.1 percent, respectively, between 2002 and 2010. 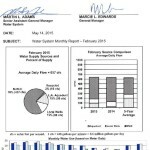 This increased demand in water use is accounted for in LADWP’s Final Year 2000 Urban Water Management Plan Update, and LADWP has identified various means and options for securing adequate water supplies to meet the needs anticipated for 2010, as well as through the year 2020. Ref: EIR No. ENV-2002-6129-EIR" However the anticipated annual supply of 718,000 AF never materialized by 2010 nor did the 757,000 AF promised by 2015 as shown in Figure 1 at the right. In 2010 the city water supply was 25% below the projection cited in the Playa Vista EIR at just 540,229 AF and it fell even further behind by 2015. The average yearly supply of 617,645 af/y between 2000 and 2014 was 23% below the projections 2015 projection. 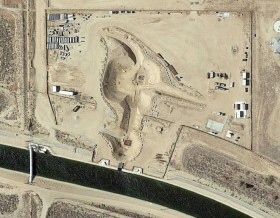 Neither aqueduct water, groundwater or recycled water projections were met. The promise of up to 799,000 af/y of water cited in this EIR is what we would call ‘paper water’. It's this promise of water that contributed to the approval of the project but it was water that can never be had. This particular development is not an isolated situation. Literally every project in the city that has been approved since 1990 cites the inaccessible water in the city's UWMP. 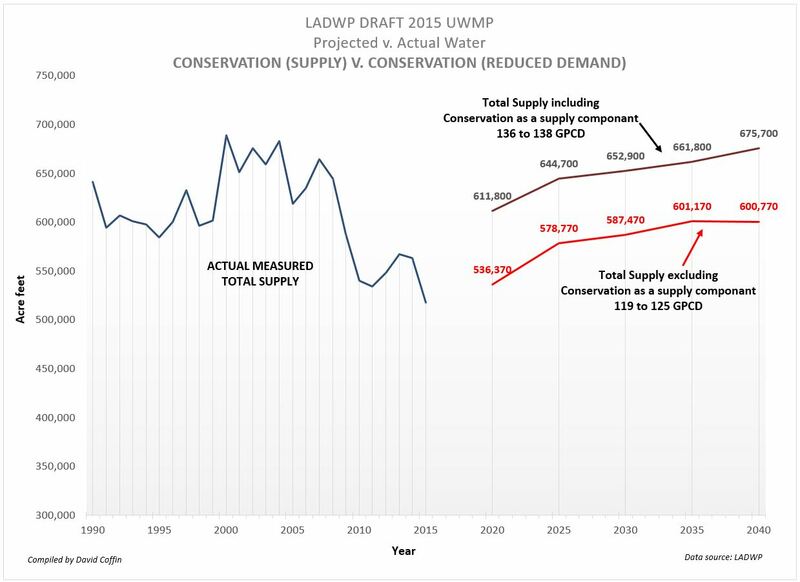 Prior and subsequent UWMP's also projected supply levels that could not be achieved. The 2005 water plan cited 705,000 AF this year and up to 776,000 AF by 2030. 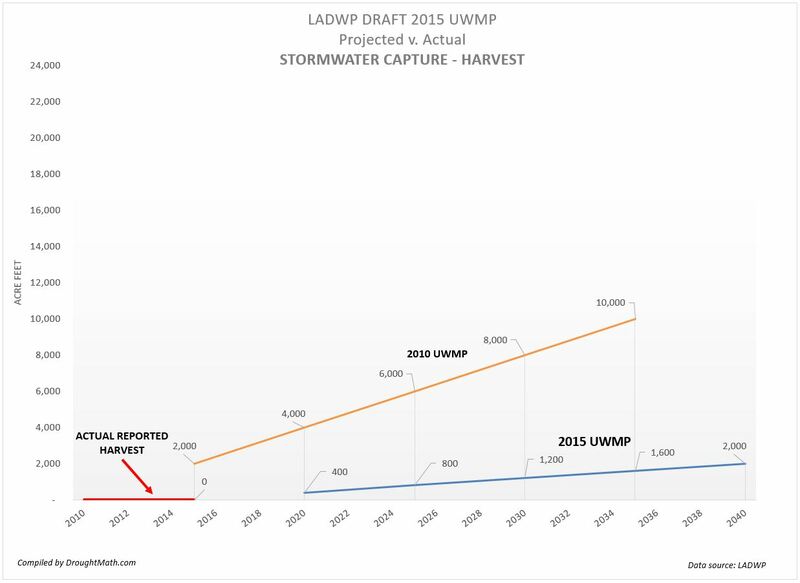 Even the current 2010 UWMP has similarly projected supplies in excess of 710,000 AF by 2035. 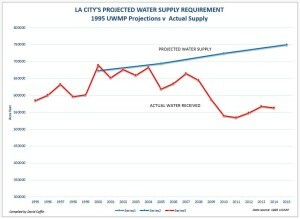 The City of Los Angeles has not been able to produce water supplies in excess of 690,000 AF since 1989. Smaller Projects Benefit by Paper Water Large projects with 500 units or more are required by SB-221 to obtain written verification that long term water supply is available for the project. 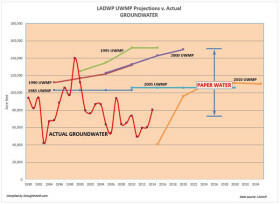 This written verification goes into a tedious analysis of the projects demand and then always comes to the conclusion based on the UWMP's paper water that "adequate water supplies would be available to meet the estimated water demands of the proposed developments..." The thousands of smaller projects with 499 units or less that are winding their way through the planning process are exempt from this formality. 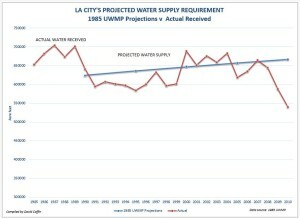 They need only cite the current UWMP which includes all existing and planned future uses of the city's water supply then come to the same conclusion that "that adequate water supplies would be available to meet the estimated water demands of the proposed developments..." To date, literally every project approved since 1990, both small and large projects alike have been the beneficiary of paper water but it hasn't benefited residents. Paper Water may be Political Cover The city's most recent 2010 UWMP greatly lowered projections but that had not stopped or slowed down the approvals of large or small projects alike. The reason why could be found in a statement made by the DWP back in 1990 saying that approving projects is ultimately a "political decision to be decided by the Mayor and the City Council". So it's likely that the water departments insistence on such large water supply projections year after year is to provide political cover to for approving all of the developments making their way through the planning process. In the 2009 California Water Update, the article Water For Growth alludes to that by noting "...even in jurisdictions with municipal water departments, elected officials may take a shorter-term view of resource adequacy than area residents do. 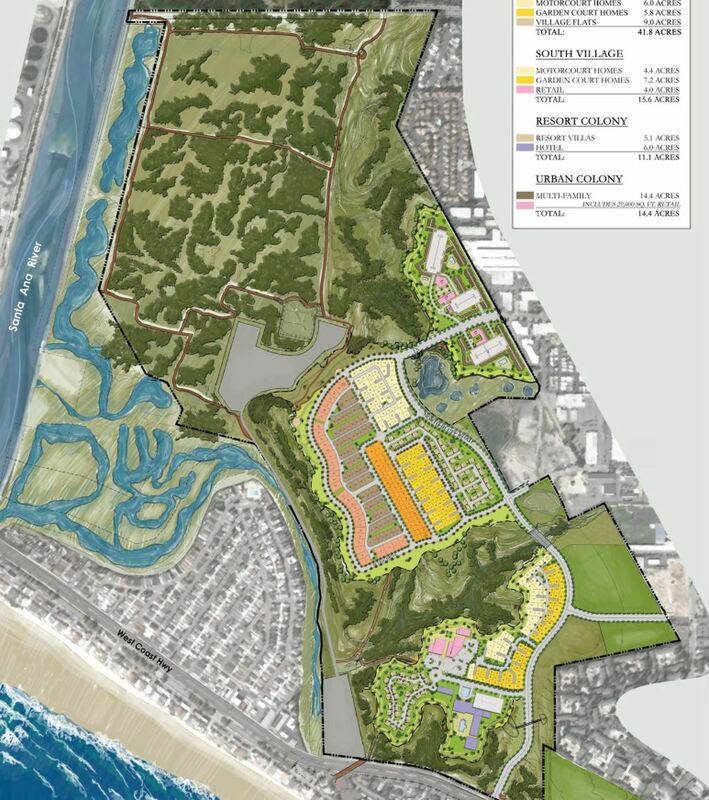 If—as is often asserted—land-use authorities are aligned with predevelopment forces, they may be inclined to favor growth, even if it means higher costs (or a loss in property values) to the community down the road."